This is about a thread entitled "Liberated" Books that was started on the Book_Arts-L listserv on March 17. It has continued into April with many interesting tangents debating whether these books should have been conserved, whether or not this kind of thing is appropriate, why people need pre-packaged design elements, altered books, installations, and perhaps ultimately whether (all) books are iconic as some seem to argue. 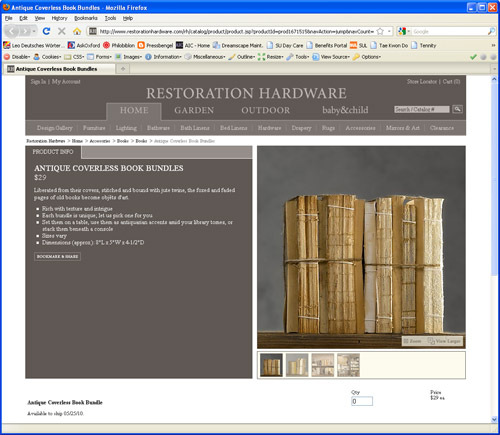 Restoration Hardware is now tearing off the covers of old books and selling them in bundles as objets d'art. Like many libraries, the one I work at manages its collections as appropriate based on a number of criteria. Withdrawn books may be sold to individuals (we have shelves in our business office so they can be browsed) at $2 for a hardcover. Other titles are boxed up and shipped to a vendor like Better World Books that will sort through them for currency/condition/general usefulness. A lot of the books that get shipped out are in need of repair, have brittle paper, ... Anyway, these books could end up who knows where on this rocky speck of dust circling in the cosmos... Some books, like out of date scientific texts are worthless though for anyone. So, say Vendor XYZ somewhere in China/Brazil/Antarctica buys several containers full (much of our recycled paper gets shipped elsewhere - good use for containers emptied by Walmart), strips the covers off, ties them together and sells them back to us. Sounds like a plan to me. Well, I wasn't far off the mark. 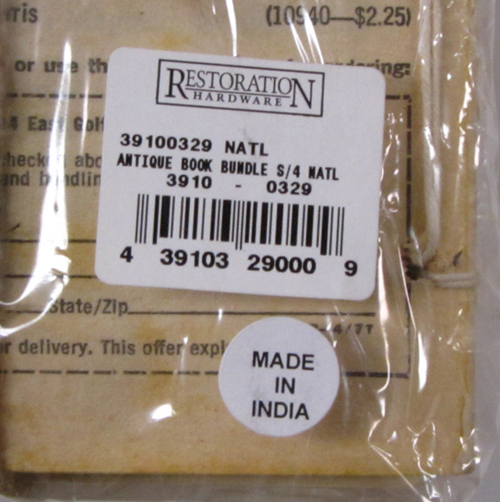 All English-language imprints, this antique book bundle was "made in" (assembled in) India. In contrast to the interesting, antiquarian looking spines of books sewn in signatures that these bundles were advertised with, mine are all commercial grade paperbacks with hot-melt spines that still had remnants of the paper cover. Still the rustic three-hole stab-sewn binding added a nice, distinctive handmade touch to it all. All in all, a rather disappointing yet fun experience. Would I do it again, "you betcha!" "I ordered a set when they first went up on the website (I was there looking for something else entirely) and got my order about a month ago or so. My books were much older and there was only one paperback from the 60s, the others were from the 20s to the 40s and were smythe-sewn and did have a little bit of an antique aura about them. I wonder if it’s been a big hit as a product and they are running out of older books!?" Sent by Phil, 4/29/2010. Lots of bundled books available via Google at fine Etsy and other boutique-like outlets. BUY [Or Rent] BOOKS BY THE FOOT: From the Strand Bookshop in NYC. 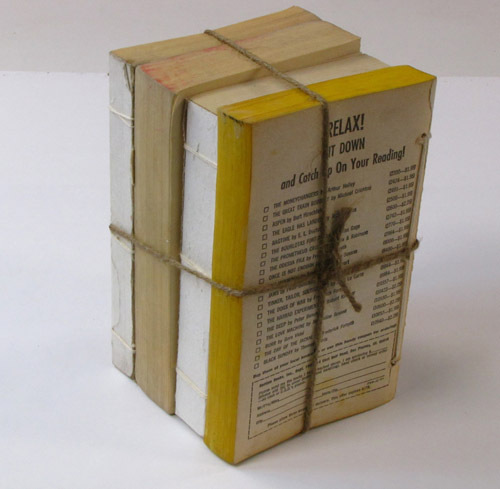 Creative New Uses for Books: Column from the New York Times Magazine, August 6, 2010. Travelling Commode in form of Large Book: From the Bloomsbury Auction site. Typewriter Boneyard does a sweet line of reading lamps made from drilled-out old books, fitted with replica Edison bulbs. Book Wall: Very interesting project by Steven Daiber / Red Trillium Press in which the circle of the book closes to begin again... See also on Flickr here and here.